It is easy to ignore work life balance and throw ourselves into long hours of toiling that leave us exhausted. In the long run, work is just one aspect of life, and not the only important one. A highly practical time management book is “First Things First” by author Steven R. Covey — a great read for those who want to get more accomplished while living a healthy life. 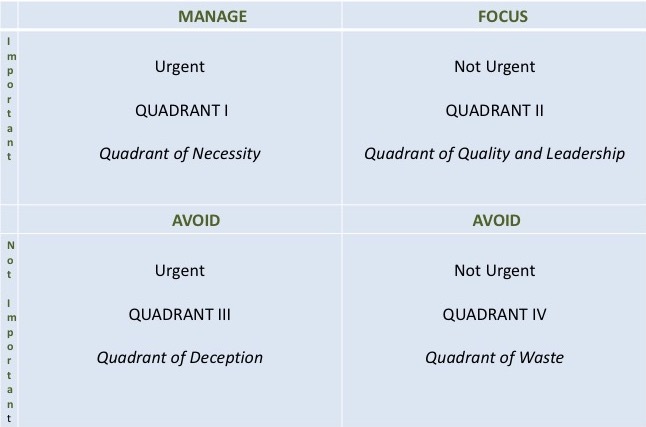 It is the concept of choosing the most valuable tasks at any given instance and not reacting to urgent needs as depicted in the grid below (Reference: First Things First). Quadrant III deception can typically occur at work — when you get an urgent SOS call from your co-worker. It is really their urgency but has little to do with what is most important on your priority list. If we organize our daily activities by priority instead of urgency, we can accomplish all the activities on our list that actually matters. This will also allow us to have enough time to prioritize on the other important aspects of our lives, such as relationships with loved ones or exercising for better health or learning new skills or for community services. Please visit Aiming Flamingo for helpful tips on de-stressing and on aging well spiritually to improve the quality of our lives. Hence, let’s use this book’s concept to look at time a bit differently — not as a passive parameter for outlining tasks to be checked off — instead, weighing time according to the importance of the task. That’s is exactly how we can get much more out of every second of our time. Aiming Flamingo (wiserlady) bio: Aiming Flamingo’s research team include scientists with doctorate degree in health sciences and rehabilitation, committed to bringing you scientifically valid information to promote greater awareness on health-related topics every week. Sound, practical, timely advice – thank you. I like this guest post. I wish this was a requirement to read what to stay away from, what to focus on and what’s most important. I worked with managers and some of them could of used this.Good Job. Sound so like what I post I guess on April 30th. So will look into it, and learn something new!